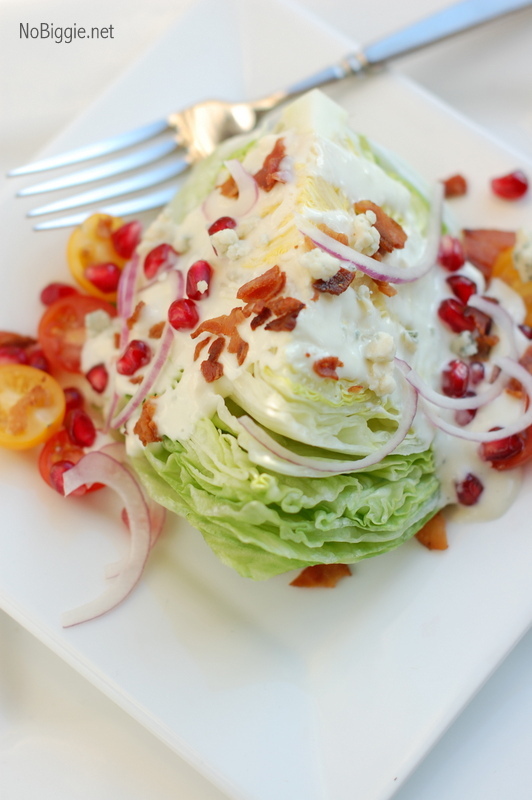 You can’t go wrong with a classic wedge salad, but…have you ever tried it with fresh pomegranate seeds? You’ve got to try it! You know what I love about salads? I love how you can add in funky ingredients and the flavor combination is an unexpected surprise. Here’s our favorite recipe for the BEST homemade blue cheese dressing. 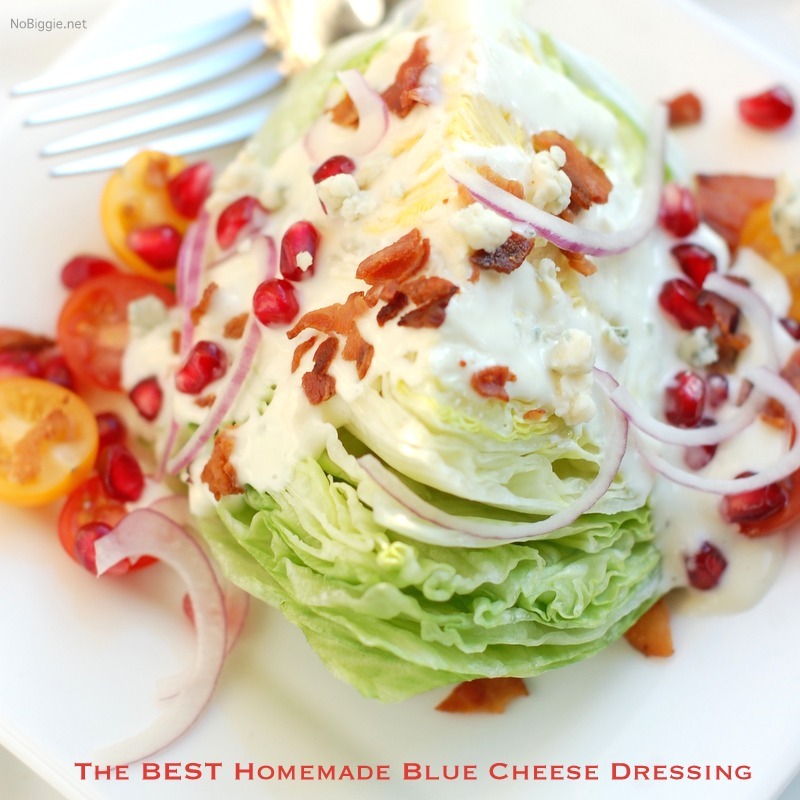 Some call it roquefort dressing…it’s basically the same thing. 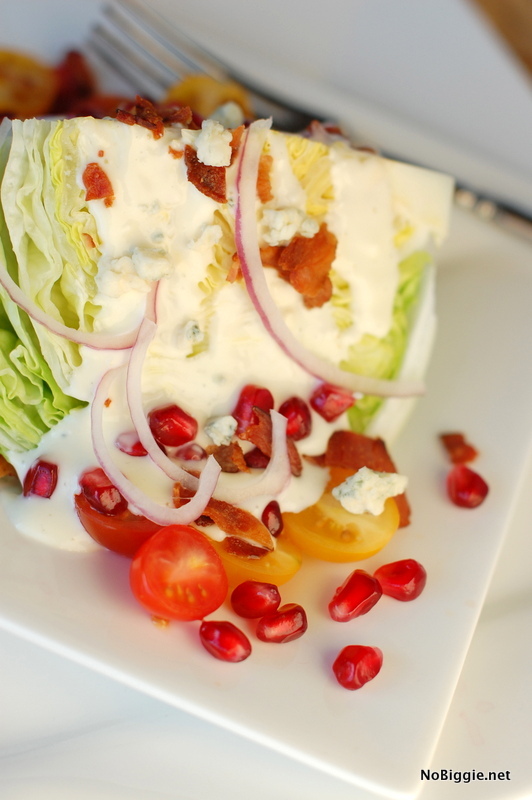 A classic wedge salad with a twist...add pomegranate seeds for a surprisingly delicious burst of flavor. 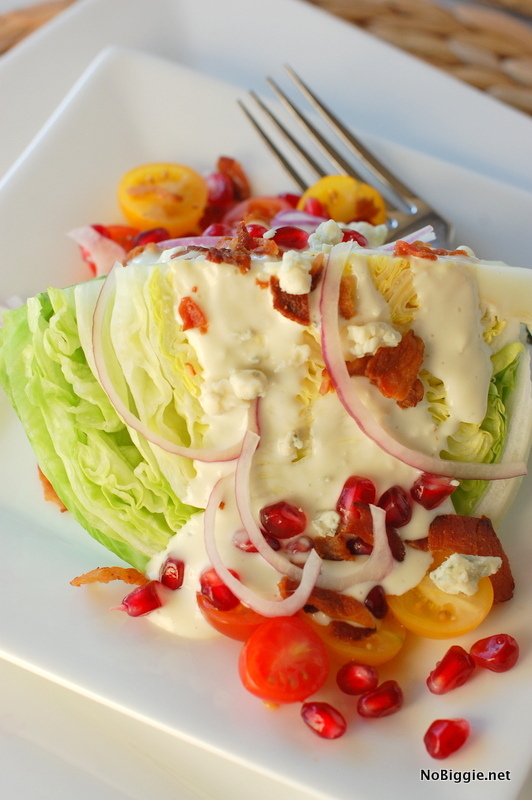 Prepare each of your ingredients separately and assemble edge wedge salad individually on separate plates. Add the dressing right before serving. Or serve them with the dressing on the side. 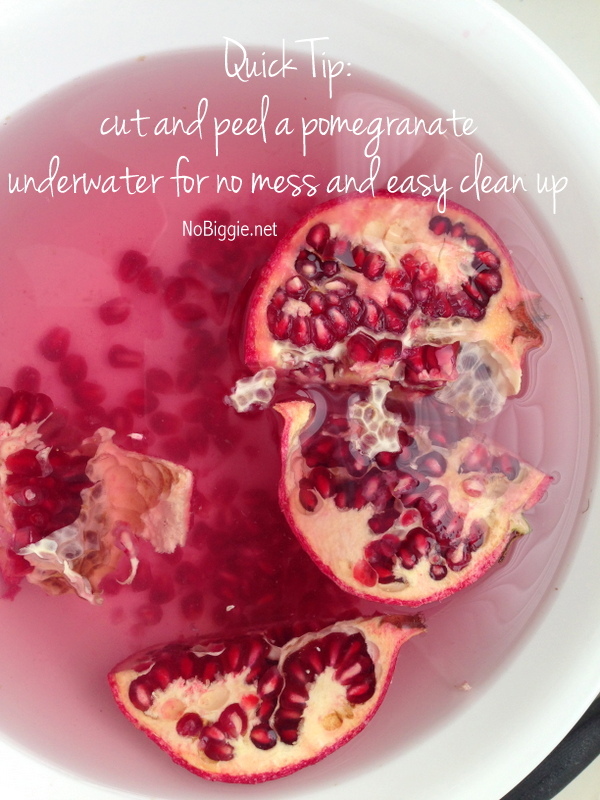 Here’s a quick tip for peeling pomegranates – peel them underwater! This tip is a lifesaver when it comes to clean up. Underwater the seeds fall to the bottom of the bowl and the rest floats on the top of the water making it easy to dump out the water leaving the seeds at the bottom. That looks so much prettier than any salad I’ve ever made. 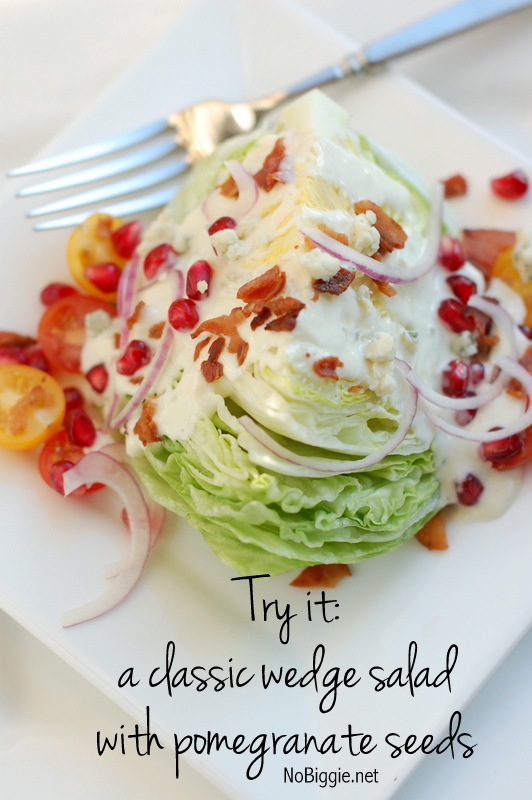 I love the wedge salad but never have I thought to add pomegranate seeds with it. We get pomegranates from my sister in laws trees every year. After I seed them my kids just eat them up… next time they are going on the salad. I love a good wedge salad and love the idea of adding pomegranate seeds to it – yum!! What a stellar twist to the classic wedge! I bet the pomegranate seeds give it the perfect touch of sweet. Can’t wait to make one of my own! Thanks for sharing! !